FORM LINK https://2019-qwil-awards.eventbrite.com Purchase your Early Bird Tickets for $10 online before offer expires. The general ticket is $20 online, and $30 at the door. The ticket includes one complimentary drink, refreshments and a raffle ticket. 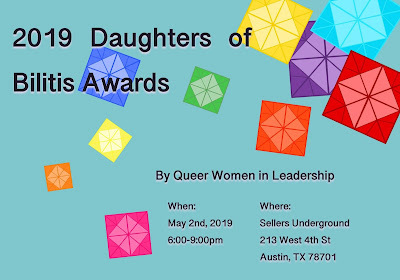 Proceeds go to support the LGBTQ Future Queer Women Leaders Scholarship (AISD). All are welcome ages 21+! We welcome contributions to the scholarship fund via eventbrite below, check or credit cards at the event. Vendor tables Spots are for Sale at $30 per table, we have limited space so please sign up below as soon as possible. Sponsorships: Please sign up via eventbrite below for Corporate or Individual Sponsorships. Please contact Mia Parton for questions at miamparton@gmail.com. QWIL is a 501c3 and is Tax Exempt. Silent Auction Items: Please sign up via eventbrite below or contact Stefanie Collins for donating items for our silent auction at stefanie@drivelegaltx.com. QWIL is a 501c3 and is Tax Exempt. Volunteers: Whether you are wanting to help with the planning, organizing or the day of the event, we appreciate your time, ideas and skills. Come join the fun, make friends and give back to the community. Please contact Jessica Soukup for Volunteer opportunities at jessica.soukup50@gmail.com. EVENT PROGRAM: Coming Soon! Disclaimer: By Attending this event you consent that photos and recordings taken at this event can be used for future promotional materials by Queer Women in Leadership at no cost or any other liability.